Virtual reality. Legalized marijuana. Hacking. The world is changing rapidly, especially as technology seems to advance at ever-increasing rates these days. The law is attempting to keep up with these advances. Are you? 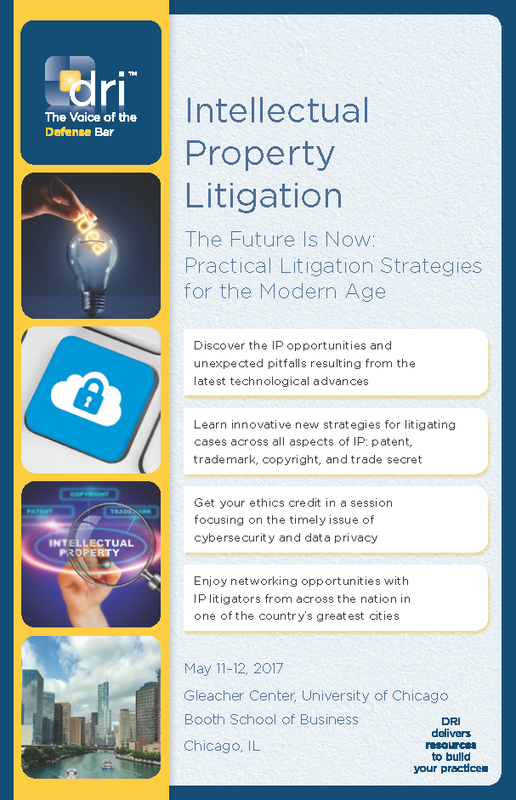 Join us at the Gleacher Center in Chicago for two days of educational, stimulating, and thought-provoking sessions focused on innovative approaches to litigating the IP case in these exciting times. Learn about fascinating technologies such as virtual reality and food e-commerce, and the IP issues relating to both. In addition to the educational sessions, join us for a number of fun networking activities in the heart of the Windy City. Get to know new colleagues or reconnect with existing ones at a number of networking events designed to take advantage of the seminar’s Chicago setting, including events jointly sponsored by the Intellectual Property Litigation Committee and the Commercial Litigation Committee, which is holding its seminar at the same time.